This page contains information on proper computer monitor adjustment and alignment. Please read the entire contents of this page before changing any adjustments on your monitor. NOTE: The background color on this page has been deliberately set to a light-pale gray for better contrast with the white levels on the screen. The image below should appear as a rainbow starting and ending with red. There should be a smooth transition from color to color with no banding and no little dots. If the upper color band looks similar to either of the bottom two rainbows bands above, or all three look the same, you may need to check the settings in your computer for the numbers of colors (for Windows users, right click the desk top, select Properties, then Settings, then select color settings). The minimum acceptable number of colors should be 256 but 16 bit, 24 bit, 32 bit, or "millions" of colors is the preferred setting for higher resolution pictures and graphics. NOTE: To check your monitors color range, go to the Color Chart page to view standard color palettes for computer monitors and displays. In photography and computing, a grayscale or greyscale digital image is an image in which the value of each pixel is a single sample, that is, it carries only intensity information. Images of this sort, also known as black-and-white, are composed exclusively of shades of gray, varying from black at the weakest intensity to white at the strongest. The 2 images below demonstrate the basic grayscale of your computer monitor. The first image has 4 squares and should be absolute black in the upper-left square. Nothing on your monitor should be darker than the black box. On the opposite end of the gray-scale should be the white box in the lower-right corner of the image. Nothing should be lighter than the white box. NOTE: The background of this page is set to a light-pale gray and if your monitor is working properly, you should be able to distinguish between the light-pale gray background and the WHITE box of the image. The gray boxes adjacent to the black and white box should have no tint to them, including the white box. That is, there should be NO pink or blue tint showing in these boxes. Be sure you view the image directly. Some monitors if viewed at even a slight angle from perpendicular will display a slight tint. The image below is a 10 section step wedge to allow you to check that your monitor has a full chromatic scale available. You should be able to see a distinct step of 10 separate shades going from an all white on the left to a total black on the right. Step back from your monitor or squint. One of these numbered boxes is about the same shade as the surrounding grid. This will be your monitors screen gamma value. Most photographer's web pages are designed for 1.8 Gamma while TV monitors are calibrated for 2.2 Gamma. If your monitor is off slightly from 1.8 Gamma, you can adjust your contrast control to bring it closer. You can toggle betweene the brightness and contrast controls to get the correct gamma maintaining the your desired brightness level. The target image below can be used to judge whether your monitor is adjusted for best viewing. 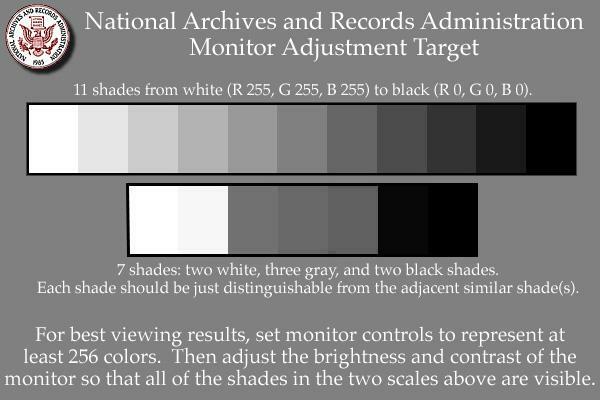 This target was designed to allow computer users to adjust the contrast and brightness of their computer monitor so that graphic images, such as scans of photographs, textual documents, or maps, look their best. After making the gamma adjustments above, the target below should be clear. The target consists of two scales of shades of gray ranging from white to black. The top scale illustrates the full range of tones that a computer monitor can represent when set to 256 or more colors (8 bits or higher). The lower scale consists of three sets of shades, including two dark shades, three middle gray shades and two light shades. The shades in each set on the lower scale should be just distinguishable from the adjacent similar shade(s). The contrast and brightness controls on your monitor adjust the appearance of the top scale. You should see a broad range of shades from white to black and all seven shades on the lower scale should be distinguishable. If your monitor is calibrated and adjusted correctly, view the chart below. You should be able to distinguish the variation between all of the 26 grayscale blocks of the image. You should be able to visualize the difference (at minimum) between X,Y and Z and ideally A,B and C. Note that this is not in agreement with the 1.8 setting above. Everyone seems to agree that a setting between 1.8 and 2.2 is where your gamma should be set. In any case, you should be able to see the difference in the individual sections of the grayscale blocks.